It hasn't been long since WiFi switched from a luxury to a standard in homes, offices, and businesses. Now, in-flight WiFi is fast approaching a standard expectation for travelers as well. 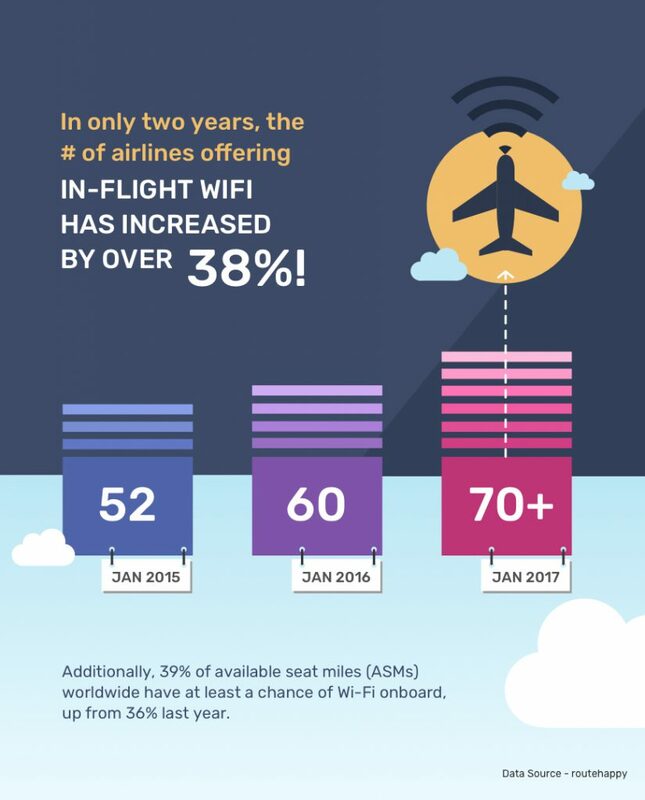 Thanks to routehappy's 2017 WiFi report, we are able to see the great strides the airline industry has made in offering WiFi connectivity on flights. In just the past two years, the number of airlines offering in-flight WiFi has increased by over 38%, jumping from 52 in January 2015 to over 70 in January 2017. However, that doesn't mean that every flight is WiFi-equipped, but that number is steadily growing as well. 39% of passengers will be stepping aboard a flight with WiFi which is 8% higher than last year. When you break this down between markets, you're much more likely to have WiFi access on a US-based airline's flight. Almost 80% of available seat miles (ASMs) have a full chance of WiFi access with only 17% of ASMs with no chance of WiFi. However, outside of the U.S., these numbers are almost exactly mirrored. Outside of the U.S., 72% of ASMs have absolutely no chance of WiFi with only 28% at some chance or higher (only 18.5% have a full chance). Worldwide, only three airlines (Icelandair, Scoot, and Virgin America) are WiFi equipped across every aircraft. Looking at long-haul flights, seven airlines have 100% of planes equipped with WiFi (Delta, Etihad, Iberia, Icelandair, Lufthansa, Scoot, United) which is great news for jet setters who get bored reading the seat-back pocket magazine for 6 hours straight. Based on the great leaps made within the past year, it will be only a matter of time until the U.S. has fully-equipped aircraft and for the rest of the world to start following suit.